Rest in peace Reserve Deputy Constantine. You were a brave soul. I was wondering if you were related to actor Michael Constantine. You were the first husband to my cousin, Marjorie Imes. While you were divorced years before your untimely death, I still thank you for your service as a family member, both blue and blood! 49 YEARS AGO, LLOYD AND I WERE ON ROUTINE PATROL WHEN A DRUNK DRIVER T-BONED OUR PATROL VEHICLE, ROLLING IT OVER. IN A STARK CONTRAST, LLOYD WAS KILLED INSTANTLY WHILE I SUFFERED LITTLE MORE THAN LACERATIONS FROM FLYING GLASS AND WHERE THE SEATBELT WENT THROUGH MY UNIFORM PANTS AT MY GROIN AS I ENDED UP HANGING UPSIDE DOWN FROM MY SEAT BELT. THE IRONY IS THAT IF WE HAD NOT BEEN AT THAT EXACT PLACE AT THAT EXACT TIME THE DRUNK DRIVER WOULD HAVE GONE THROUGH STORE FRONT! LLOYD WAS ONE OF THOSE RESERVE DEPUTIES WHO YOU COULD ALWAYS COUNT ON TO DO THE JOB CORRECTLY. IN A FURTHER IRONY, BEFORE GOING ON THE JOB FULL TIME, I TOO SERVED AS A RESERVE DEPUTY AND KNOW HOW DEDICATED THESE PEOPLE SERVE WITHOUT PAY. NOT A COLD RAINING DAY GOES BY THAT MY BACK DOESN'T END UP REMINDING ME OF THAT INSTANT WHERE THE WORLD LOST A GOOD MAN. TO THOSE WHO SERVE.....THANK YOU AND BE SAFE. Rest in Peace, Deputy Constantine. Your sacrifice is not forgotten. Your heroism and service is honored today, the 45th anniversary of your death. Your memory lives and you continue to inspire. Thank you for your service. My cherished son Larry Lasater was a fellow police officer who was murdered in the line of duty on April 24, 2005 while serving as a Pittsburg, CA police officer. No fellow Los Angles County law enforcement personnel killed in the line-of-duty, should be forgotten. 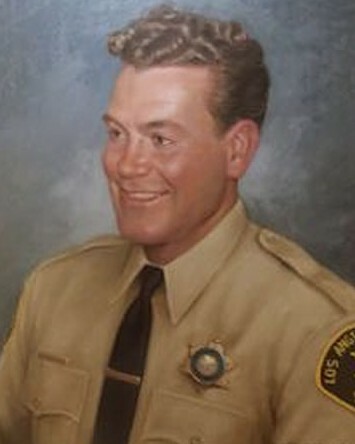 Deputy Constantine, it's been 42 years since you were so tragically taken from this life on your 42nd birthday. It's a sad irony. Why on Earth you were working on your birthday, I can't figure out, but you knew better and made that small sacrifice which led to a huge, sad sacrifice. If there was ever an example of selflessness, it's you and I salute you for it. I can only hope and believe that the drunk who killed you found justice, no matter what form that justice may have taken. Thank you, may God bless you and all those you left behind and may you continue to Rest in Peace, Brother. You are a true hero Lloyd. You will forever be a part of the station.